Up for review today is Blind Man’s Bluff, a cigar released at IPCPR 2015 by Caldwell Cigar Co. You may know Caldwell cigars as the boutique cigar company releasing some of the most interestingly branded cigars on the market (i.e. The King is Dead, Long Live the King, Anastasia, Hit & Run, etc). Blind Man’s Bluff. Up for review today is the Toro (generally my favorite size to smoke). 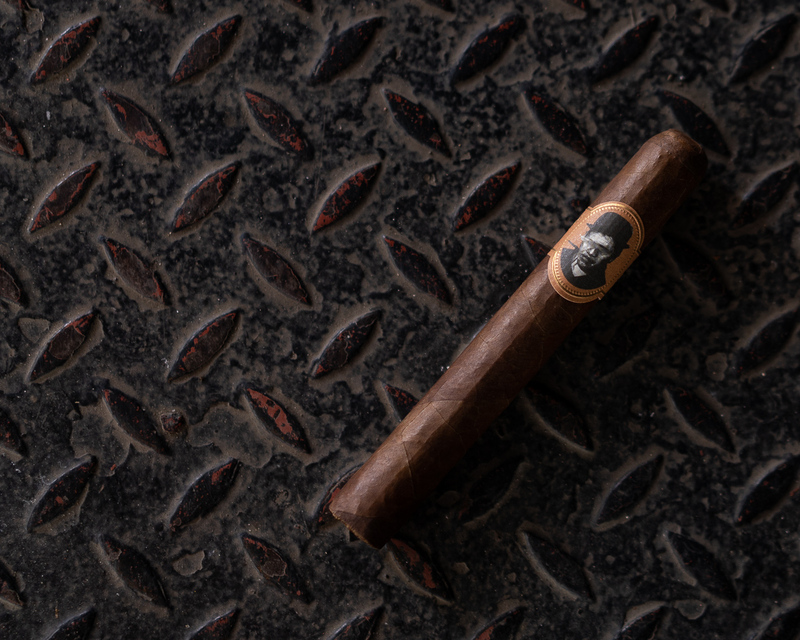 Caldwell Blind Man’s Bluff comes wrapped in a rich, dark brown Ecuadorian Habano wrapper. The label has a simple, classic design, but an absolutely cool illustration at the center, with “WE OWN THE NIGHT” emblazoned on the side. 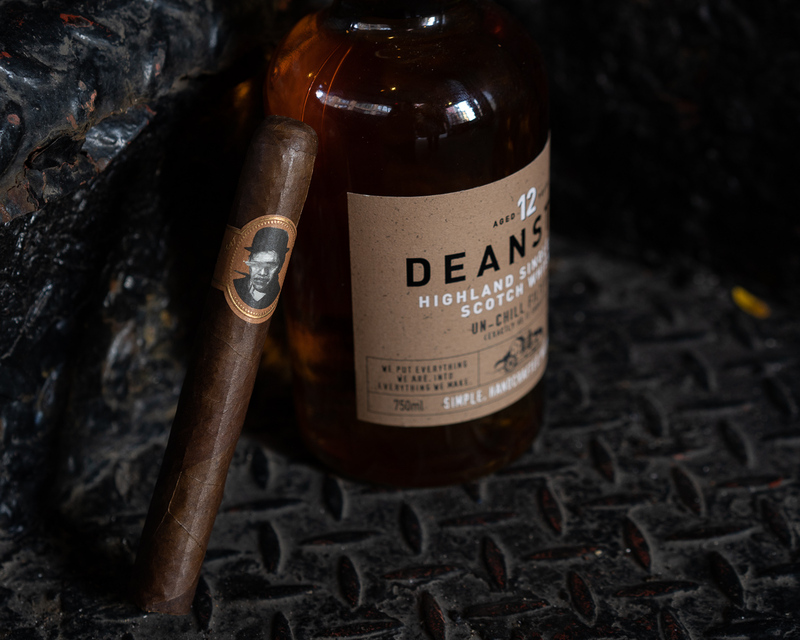 The aroma off of the foot of the cigar is extremely fragrant, with barnyard, sweet hay, stone fruits, natural tobacco and very light black pepper. After cutting with a straight cut, the draw reveals itself to be too lose, about a 4/10 in terms of restrictiveness. In the first few lit puffs, the Blind Man’s Bluff opens with rich, oaky, medium bodied smoke. There’s quite a bit going on in the palate, with slightly bitter oak, leather strips, creamy dark chocolate pieces, and a salted popcorn which rounds out the dominant bitterness nicely. Smoke production is good, but the draw is absolutely too loose and I have no doubt it will cause issues later on. The retrohale is spicy but mostly manages to avoid overpowering the rest of the experience. This makes the smoke a bit too abundant and I find also increases the heat of the smoke prematurely. It’s a great opening for the Blind Man‘s Bluff, and the flavor experience begins to evolve as the ember approaches the first inch. Earth and a nice pepper emerges that activates the tip of the tongue. Meanwhile, secondary notes of chocolate cake, cherry, lemon peel, minerals, and touches of cream on the finish. To me, it’s a very enjoyable, though the earth at times becomes a bit muddy, making it hard to fully enjoy the secondary flavors. Construction wise, the burn to this point is wavy but mostly straight. The salt and pepper ash of the Blind Man‘s Bluff hangs on to the beginning of the second third. At about the same time, the flavors shift once again (good complexity! ), taking on character comprised of charred oak, leather, lemon peel, baking spices, and tangy fruit. On the retrohale, white pepper emerges, along with a faint toasted barley bread. The body of the cigar at this point is medium to full, with a thick, chewy texture, and strength clocks in at medium. The burn does start to stray near the end of the second third, but a quick purge is all that’s needed to get it back on track. The final third of blind man‘s bluff suffers a bit of excess heat due to the overly free draw, but manages to hang on to the flavors that made the preceding thirds enjoyable. There’s charred oak, earth, some black pepper and minerality make up most of the profile, with charcoal and toasted bread on the retrohale. Near the last three quarters of an inch, the smoke heats up too much, forcing me to put the cigar down. For the price, Blind Man‘s Bluff by Caldwell Cigars is easy to recommend. Despite the overly loose draw, it served up a nice, thematically consistent profile of charred oak, earth, leather, and cocoa, with nice secondary flavors of stone fruits and lemon peel. It didn’t always strike a perfect balance between these notes, but it is undoubtedly a very enjoyable smoke and one I can easily recommend.